Formula 1 heads back to the desert this week, as the state-of-the-art Yas Marina Circuit hosts the visually spectacular Abu Dhabi Grand Prix. Money was seemingly no object when the Middle Eastern country constructed a purpose-built facility from scratch in two years, hosting the first ever twilight grand prix in 2009. Red Bull's championship leader Sebastian Vettel has won two of the three races since the event's debut and arrives in Yas Marina with a 13-point lead over Ferrari's Fernando Alonso. Can the German make it three out of four and inch closer to becoming the youngest ever triple world champion? Find out this weekend as the BBC has live coverage of practice, qualifying and the race. The 5.554km track features three distinct sectors. The first is a series of fast, flowing corners, followed by two long straights and a tight and twisty section completing the lap - meaning a compromise between straight-line speed and good traction is required. The main straight is the second longest in Formula 1 at 1.14km and is one of five anti-clockwise tracks on the calendar - Singapore's Marina Bay, the Korean International Circuit, Brazil's Interlagos and the new Circuit of the Americas in Austin being the others. Like last year, there will be two DRS zones. One comes just after Turn Seven, the other after Turn Nine on the apex of Turn 10. Drivers will have the choice of the soft and medium compound tyres on a track which is high in grip and tough on tyre wear. Built on a man-made island in the east of Abu Dhabi, Yas Marina circuit organisers imported the granite used to build the track from the United Kingdom. While many venues require teams to just 'make do' with the facilities, Abu Dhabi has pulled out all the stops to make their visitors' stay as comfortable and unique as possible. The pit garages, for example, offer ample space and are air conditioned to help staff cope with the hot, dry conditions. The pit lane features an exit which funnels out through a tunnel under the track, while the venue boasts the world's largest permanent sporting facility lighting system. That allows the race to start in daylight and end in darkness. All this is set against the backdrop of the iconic 499-room Yas Hotel which straddles the track and uses 5,389 pivoting LED panes to produce a spectacular sparkling light show. Next door, you'll find Ferrari world, an indoor amusement park which is housed underneath a 200,000m square roof. It houses the Formula Rossa roller-coaster that can achieve a top speed of 240kph. Sauber driver Kamui Kobayashi: "I find the grand prix in Abu Dhabi very exciting because it's a twilight race, and the only one of the season. It's very special to start in daylight and then race in the dark. This creates a really unique atmosphere, which I like." "When Formula 1 drivers are asked for their thoughts on the Abu Dhabi Grand Prix track, they always talk about the 'facilities' being fantastic. "In other words, it's very modern, there are nice hotels, it looks fabulous lit up at night and there are big run-off areas. What they rarely mention is the track itself. "On paper, it should be good - there is a good mix of corners and long straights. But somehow it just hasn't worked out. Overtaking is extremely difficult and the track lacks any significant challenge. 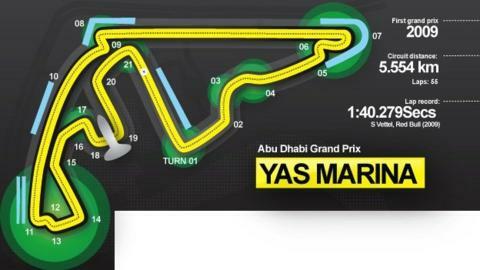 "As BBC F1 co-commentator David Coulthard puts it: 'The track, unfortunately, does not live up to the setting. The only fast corners are Turns Two and Three, and the rest is box-ticking.'" Mercedes driver Michael Schumacher: "Abu Dhabi is one of the races I look forward to travelling to. The facilities there are state of the art, very modern and very attractive." Lotus driver Kimi Raikkonen: "You really have to qualify well to be on the top, and to get a strong result from there. There are many corners and you need good overall downforce and grip. The car has to ride the kerbs very well, too." McLaren driver Jenson Button: "It has usually been quite difficult to overtake here, especially last year, but I think that DRS will change all that. The back straight is one of the longest in Formula 1 so I expect to see a lot of action there." Sauber driver Sergio Perez: "Abu Dhabi is a very special place for me as it was there where I jumped into a Formula 1 car for the very first time. This was only two years ago, but it feels as if this test took place ages ago." 2011 - Lewis Hamilton was gifted the lead when Red Bull's Sebastian Vettel - who had already won the championship by that point - spun out on the opening lap as a result of a puncture. The McLaren driver fended of a stern challenge from Fernando Alonso to take his third win of a season in which he struggled for form, with Jenson Button third - the position he has finished in every race in Yas Marina. 2010 - Vettel produced a dominant drive to win the final race of the season and claim his maiden title in dramatic circumstances. The 23-year-old, who had not led the standings all season, arrived in Abu Dhabi in third place, trailing Alonso and Mark Webber. But his two mains rivals could only finish seventh and eighth respectively, producing a swing of points which saw the German become the youngest ever Formula 1 world champion. 2009 - Red Bull dominated the inaugural Abu Dhabi Grand Prix with Vettel cruising to victory ahead of team-mate Mark Webber. Lewis Hamilton led away from pole, but retired from the lead on lap 20 with a brake problem. Jenson Button, who clinched his maiden world title at the previous race in Brazil when racing for Brawn GP - completed the podium.